Pat Cohen lives in upstate New York where there is an abundance of warm water streams, lakes, and farm ponds to fish; although most anything with gills is fair game. He began fly fishing in 2008 and fly tying in 2009. Fly fishing and tying have become an essential part of his life. He specializes in deer hair bass bugs, but ties everything from streamers to nymphs. The artistic freedom that fly tying offers is what drew him to it. All of his flies are meant to be fished with the exception of the display offerings. Every piece of each bug - be it the hair, feathers, or weed guards - has a purpose. The final product is a fish catching fly and a miniature sculpture all in one. To his way of thinking, there is nothing like watching a five pound bucketmouth or an 18 inch smallie erupting from the water to crush one of his bugs as it's drawn across the surface. 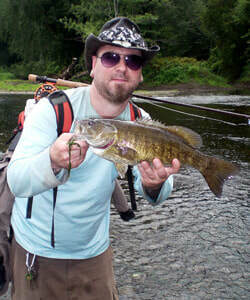 Presentation - Powerpoint on "Catching Smallmouth Throughout the Season"